This course examines various monitoring systems individually to help you achieve a detailed understanding of what that system is reporting. It is also important to view these systems from a distance to make data comparisons in order to get to the most logical conclusion in the diagnostic process. There is a big difference between a do-it-yourself, bargain scan tool and a professional grade scan tool. In this course, Ron Bilyeu takes you through the ins and outs of reading and understanding computer engine data and how to apply that data to real world diagnostics. This course examines various monitoring systems individually to help you achieve a detailed understanding of what that system is reporting. It is also important to view these systems from a distance to make data comparisons in order to get to the most logical conclusion in the diagnostic process. 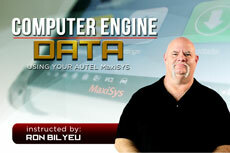 Ron Bilyeu utilizes the AUTEL Maxisys to read all the data in the course.